Heat grill to medium-high heat. Combine dressing and garlic in a shallow dish. Add tenderloin, onion, and bell pepper; toss to coat well and let stand 20 minutes. Alternately thread meat and vegetables onto 4 long metal skewers. 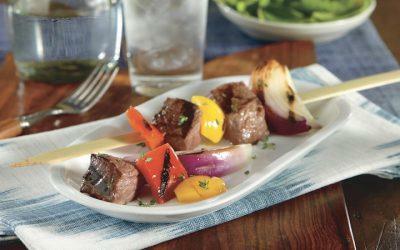 Brush any remaining marinade from dish over meat and vegetables. Grill skewers on covered grill 5 minutes on each side. (Tenderloin will be pink in center and vegetables will be crisp-tender.) Top with thyme. Exchanges per serving: 1/2 Fat, 2 Vegetable, 3 Meat.